We love a Sunday roast but when it’s just the three of us we often end up with heaps of leftovers. Diana Henry has a book called Food from Plenty which not only contains recipes for roasts but lots of ideas for what to do with the excess. We made this pie with leftover Mallorcan Spiced Pork. Serve with a green salad or buttery cabbage. Wine Suggestion: as this is a very down to earth dish the wines that work have a grounded earthiness. A well made, terroir driven Chardonnay or Pinot Noir would be our choice. Tonight is was the Deux Montille Rully Chaponniere which was floral, citrus and pear aromas on the nose, but sappy, earthy and textural on the palate. Pure, fresh and engaging; a good combo. Melt the butter in a sauté pan and cook the leeks, onions and bacon over a medium heat until starting to brown. Add the apple slices and cook until they too have coloured slightly. Add the pork to the pan with the cider or juice, stock and mustard. Season and bring to the boil. Reduce the heat, add the parsley and breadcrumbs and stir. Put the pork mixture into a pie dish and leave to cool a bit. Roll out the pastry on a lightly floured surface. Cut strips off the pastry to stick round the edge of the pie dish. Lightly wet one side of the pastry strips and press down on the rim of the dish. Lay the remaining pastry on top and press down. Trim off the excess pastry and crimp the edges. Use any leftovers to decorate the top. Make a few slits in the centre with a sharp knife. Use a blunt knife to knock up the sides of the pastry all the way round to help it rise. Brush with egg and bake for 20 minutes or until golden and puffed up. Chicken pie is an autumnal dish in our house and we usually try a different version every year. We particularly liked this one flavoured with cider and apples. Wine Suggestion: A natural suggestion is to drink the cider you used to make the pie, and we finished the remainder of the bottle likewise. Our choice this evening was from Normandy, courtesy of our last trip to France. When matching a wine, we think the appley character of Chenin Blanc is what to go with. If your prefernces are French wine, then a Vouvray is a good choice; tonight we chose the Secateurs Chenin Blanc from Swartland in South Africa; a country that really excels with this grape. Melt 40g of the butter in a saucepan and stir in the flour. Continue to stir over a medium-low heat for a minute to make a roux. Remove from the heat and gradually add the cider, mixing carefully with a wooden spoon. Keep stirring until all the cider has been added, then gradually add the milk. Season and return the pan to the heat and, stirring continuously, bring to the boil. Reduce the heat and simmer for 3 minutes. Stir in the mustard, lemon juice and crème fraîche and taste for seasoning. Melt the other 20g of butter in a frying pan and gently fry the leeks and apples for 5 minutes. Add 2tbsp of water, season, cover and cook over a gentle heat for 8-10 minutes or until tender. If there is a lot of juice you can increase the heat to reduce it. Add the chicken and half the cheese to the sauce, then bring to the boil. Reduce the heat and heat the chicken through. Gently stir in the leeks and apples. Taste and add more mustard or lemon juice if needed. Spoon the chicken mixture into a 25 x 20cm pie dish or a round dish 25cm across. The dish should have a capacity of 1.3 litres. Sprinkle over the rest of the cheese and leave to cool completely. Roll the pastry out on a lightly floured surface to the thickness of a euro coin. Cut off a strip the same width as the lip of your dish. Wet the lip and press the strip onto it. Brush the strip with water and place the rest of the pastry on top. Press the edges to seal, then cut off the excess. Crimp the edges and decorate the top with the trimmings. Make 3 small slits in the pastry close to the middle, then brush the top with the egg mixture. Bake for 30-40 minutes or until the pastry is golden and puffed up. Serve immediately. A classic that can be pre-baked ahead of time and warmed in the oven when you need it … useful for entertaining and when someone gives you a bag of apples. Wine Suggestion: Dessert wines often go really well with cooked apples. If you have some Sauternes, Monbazilllac or other late harvest or bortytised dessert wine lying around now’s the time to crack it open. Heat the oven to 190C/170 fan/gas 5. Put the flour and 110g of sugar into a large bowl with the diced butter. Rub the mixture with your fingers until it resembles breadcrumbs or put the ingredients in a food processor and process until sandy. Put the apples into a pie dish and toss with the 2 tbsp of sugar. Spread the crumbs over the top and spread out to the edges. Sprinkle the oats over the top if using. Put the crumble in the oven on a baking tray for 35-40 minutes. Serve with cream or custard. We made this sauce as an incidental side to some duck legs and the side trumped the main … so much so that the legs will not be reviewed but this sauce definitely will! The revelation for us is the baking of the apples whole which seems to add something special. Score the skin of the apples round the middle to prevent explosions and put them in a baking dish. Bake at 180ºC/Gas 4 or thereabouts for about 40 minutes or until they have puffed up and the apple is soft and frothy. Put the blackberries into a small pan with a tbsp of water and bring to the boil. Crush lightly with a fork. Scrape the apple flesh off the skins into a bowl. 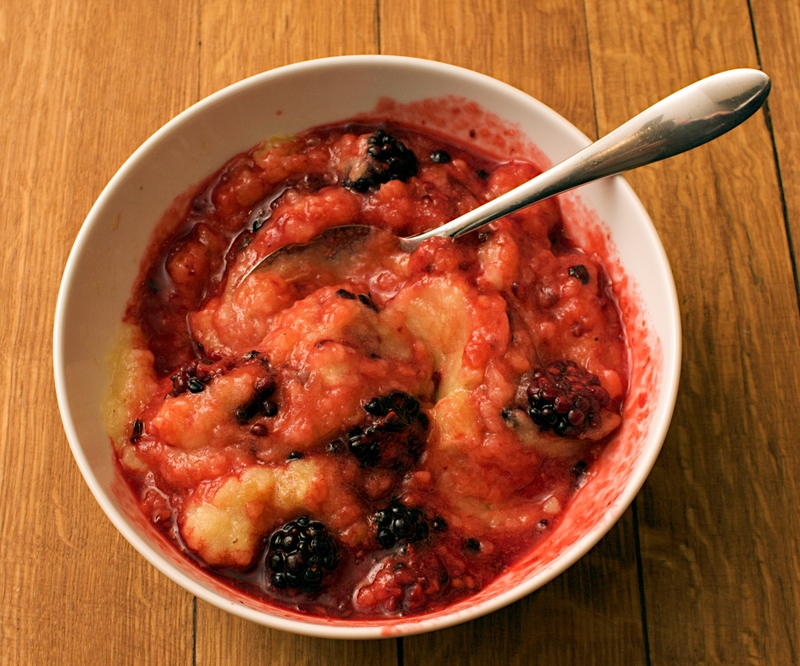 Beat the sugar in with a fork and stir in the crushed blackberries. (Original recipe by Nigel Slater, Tender: Volume II, Fourth Estate, 2010).